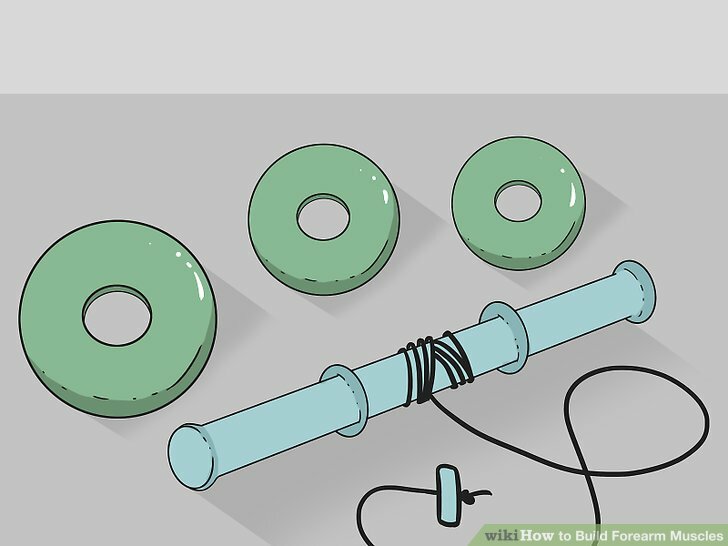 Get or make a wrist roller. 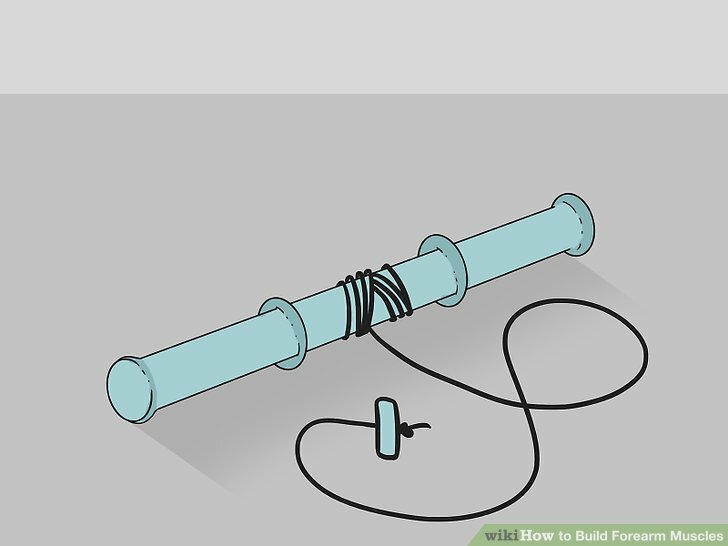 This is simply a bar or rod with a rope tied around its midpoint. The other end of the rope is attached to a weight. This simple piece of equipment is one of the most effective ways to build forearm muscle and train grip strength. Start with a very light weight, and increase the weight gradually. Most people cannot lift nearly as much with their wrist as they can with their full arm. Find the weight where a set is challenging, but not painful or extremely difficult. Hold the rod in front of you. Grip the rod in both hands and hold it in front of you at around waist level. Since this position is not difficult to maintain, your wrists will be the limiting factor of the exercise. This lets you repeat the wrist roller exercise as long as your wrists are holding up. Maintain your grip with one hand and turn the rod with the other to wind the rope around the rod. Alternate the turning and gripping hands until the rope is fully wound and the weight reaches the rod. Rotate the weight back down. Rotate the rod the other way until the rope is fully extended. Do this slowly and evenly. If the rod keeps slipping out of your grip, wrap a grip around the rod to reduce friction, or just focus on the upward motion. Lift a heavy dumbbell or kettle bell in each hand. 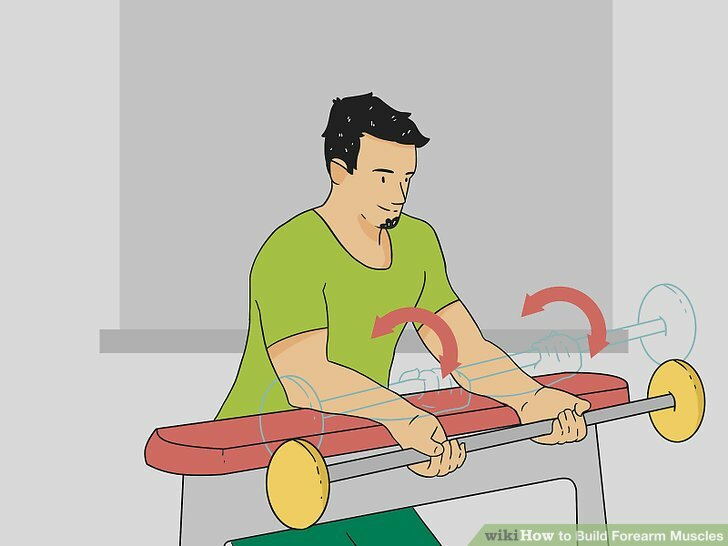 This exercise is geared toward working your forearm muscle endurance by maximizing the time under tension. Start by lifting the dumbbells or kettle bells of your preference. Since “heavy” is relative to your routine, try a weight heavier than you would try to curl but not so heavy that you have to strain. You can always add more or less as needed. In order to put the brunt of the weight on the correct muscle groups, you want to brace your abs, keep your chest up, and keep your shoulders back. If you hunch, you’ll divert too much of the strain to your upper arms or back. 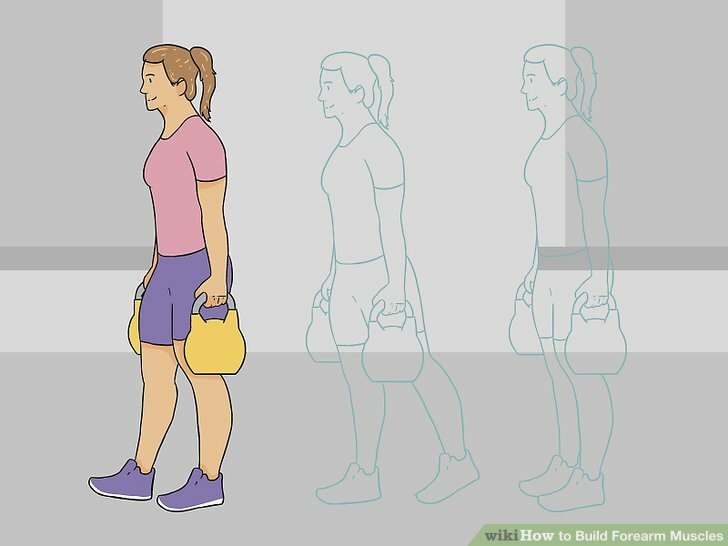 The natural movement and inertia from walking will work your forearms much more than simply standing in place holding the weights, so start walking. Try this workout in sets of twenty yards to start with, or whatever you find comfortable. Increase the length of time gradually. 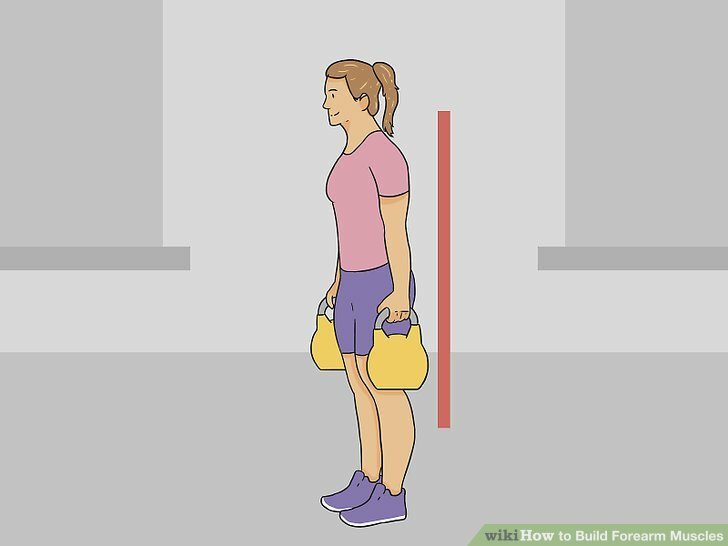 Walking for a long time or using heavy weights before you are ready can cause a shoulder injury. Sit at the edge of your workout bench. This exercise requires you to be in a sitting stationary position, so take a seat at the edge of your workout bench. 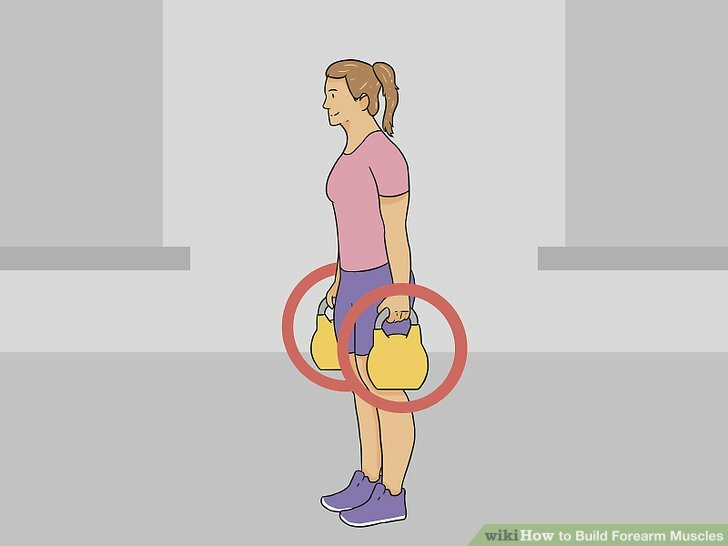 You also want to have your feet flat and your knees shoulder-width apart. Lift an appropriate dumbbell or kettle bell in each hand. Since this is specifically targeting your wrists and forearms, you will want to start with less weight than you typically use for full-arm curls. You can start with as little as five-pound weights in each hand and increase them incrementally if they prove far too easy. Rest your elbow on your thigh with your arm flat. 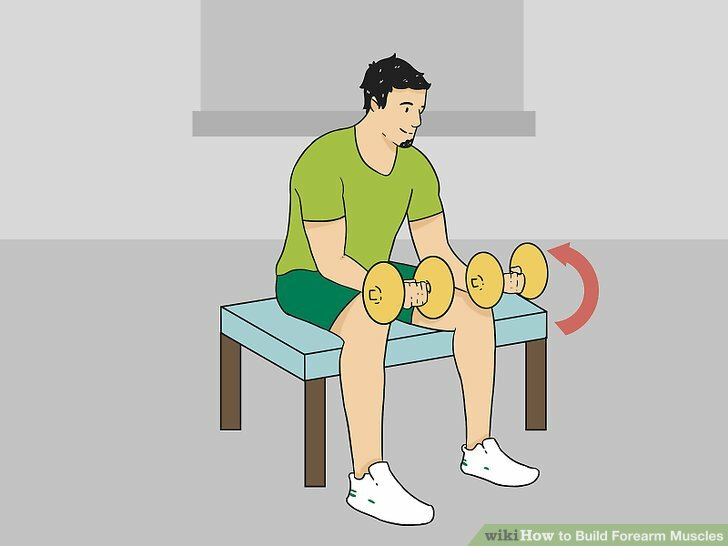 By resting your arm on your leg, you put the majority of the weight on your forearm instead of your bicep. This position also braces your arm, which allows you to perform the curls with less risk of injury. 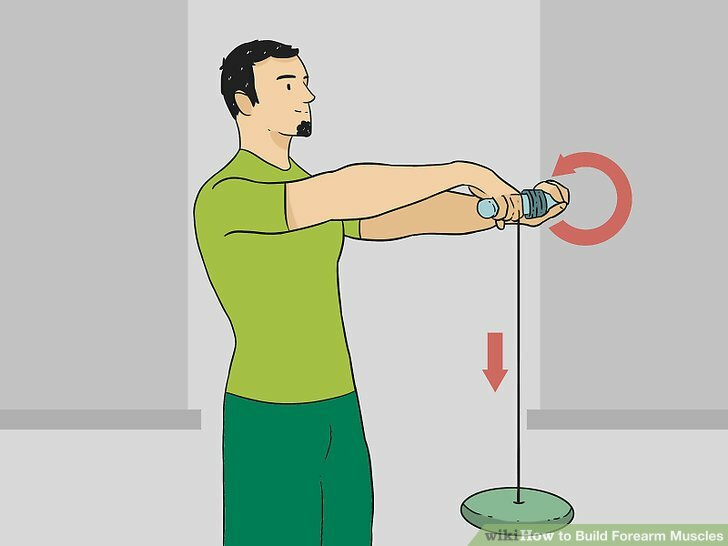 Curl the weight by moving only your wrist up and toward you. Each rep of this workout requires curling the weight up and toward you and then back down. You additionally want to ensure that you breathe out while curling the weight and that you inhale while lowering it. If you have chosen the ideal amount of weight for this exercise, then you should be able to do a set of twelve-to-fifteen repetitions and just barely be able to perform the final one. Sit with your forearms down on a flat bench. For this exercise, you want to place your forearms flat with your hands and wrists protruding off the edge of the bench. 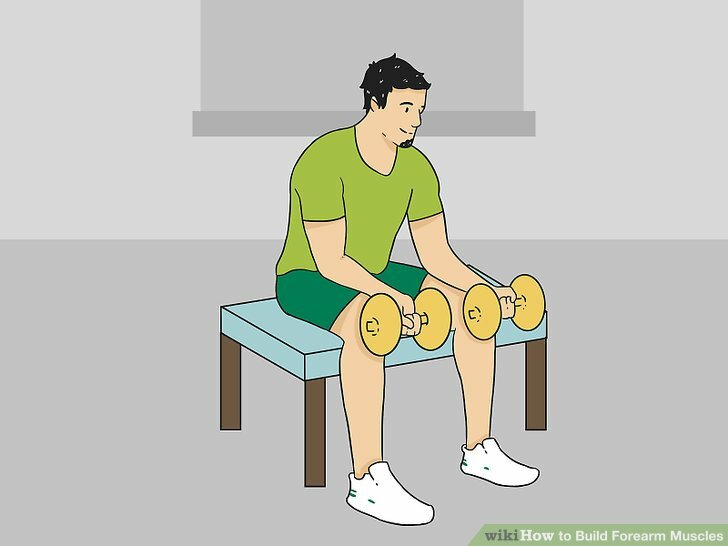 If you use a standard workout bench, you can simply kneel to the side of it in order to rest your forearms on the bench—just make sure to put something down to cushion your knees. Lift up the barbell with both hands. In order to balance the weight, you want your hands roughly shoulder-width apart to form your grip on the barbell. To start, use a standard grip with your palms facing upward. The starting position is going to be with your wrists lowered so that the barbell is hanging low in your grip. Curl the barbell up and toward you. 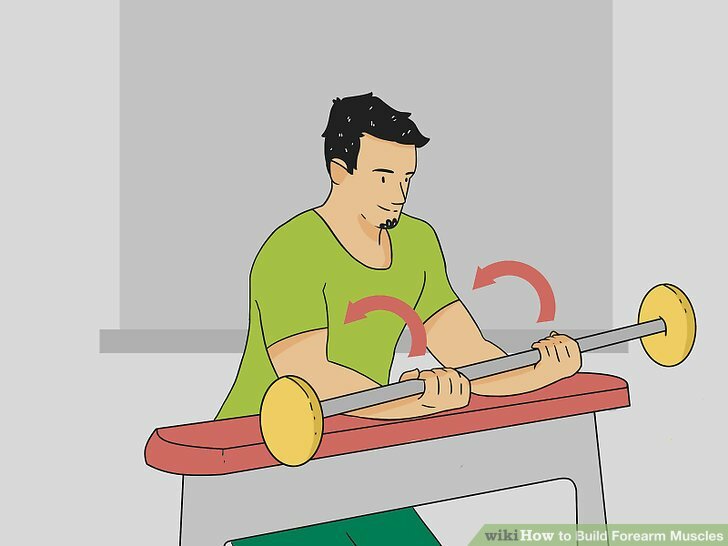 With a slow, controlled motion, you want to curl the barbell up and toward you. By moving the barbell slowly, you maximize the gain on each repetition. 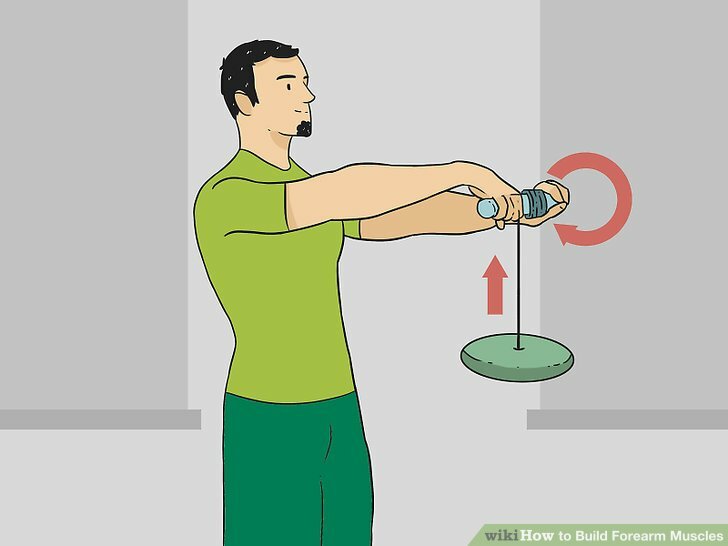 You want to curl your wrists all the way, bringing the barbell as close to you while only using your wrists as possible, before letting it back down. As with the individual wrists routine, you want to do twelve-to-fifteen reps in your set before stopping. If you cannot do this many, try curling less weight. Flip your arms over and do the curls downward. This is another workout that you can do with either upward or downward curls. To work a different forearm muscle group, turn your arms over on the bench so your palms face downward. 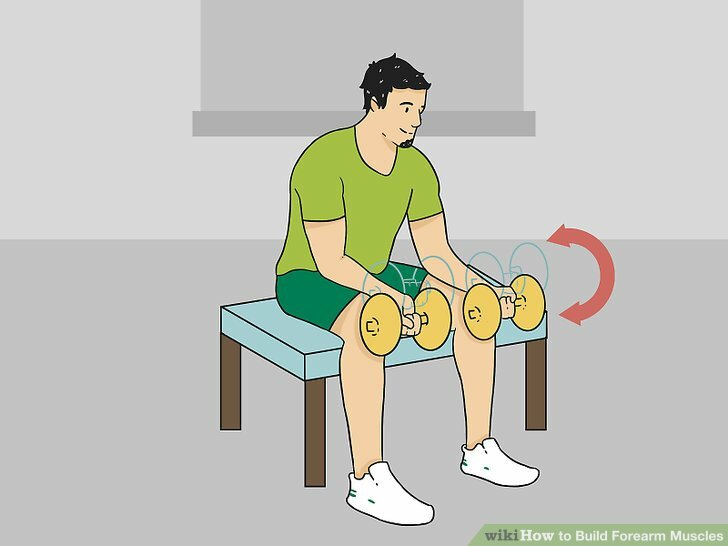 Then lift the barbell back up and do the curls so you can see the backs of your hands. Increase the girth of your grip. You can additionally increase the workout on each forearm by enlarging the grip on your barbells and dumbbells. You can purchase a fitness product tailored to go over the bar or simply wrap a towel around it. The larger grip area forces you to squeeze harder to maintain your hold, which in turn works your forearms even more. Use a hammer grip whenever possible. 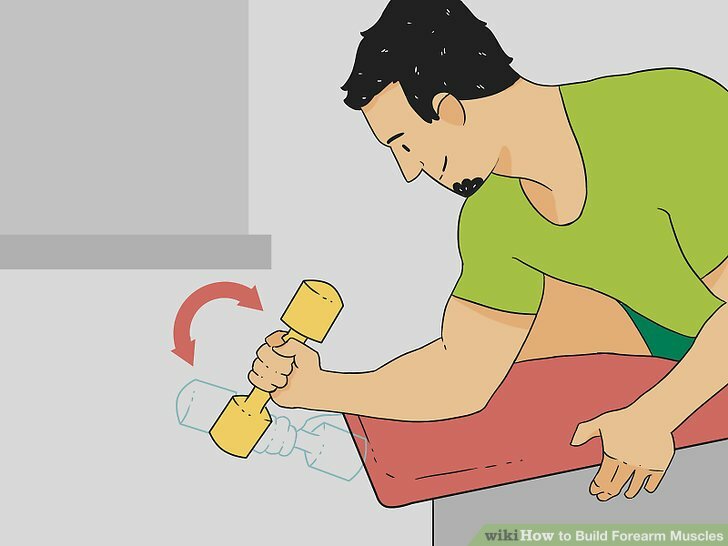 Utilizing a hammer grip for other exercises will also increase the workout on your forearms. A hammer grip is when the palm faces inward rather than up. 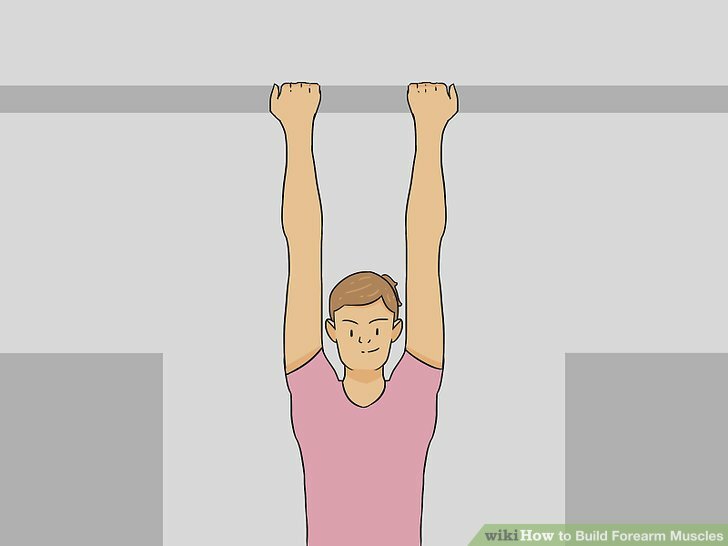 You can use a hammer grip with dumbbells or even two-handed workouts such as chin-ups. 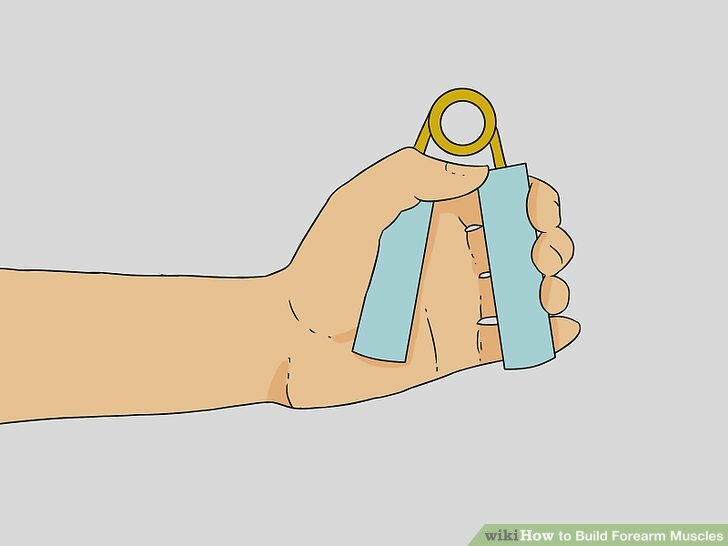 By using a hammer grip, less weight rests on your palms, which forces you to grip more tightly. Use handgrips while away from the gym. A good old-fashioned pair of hand grips with the metal tension coil at the top are an easy way to work forearm muscles while multitasking. 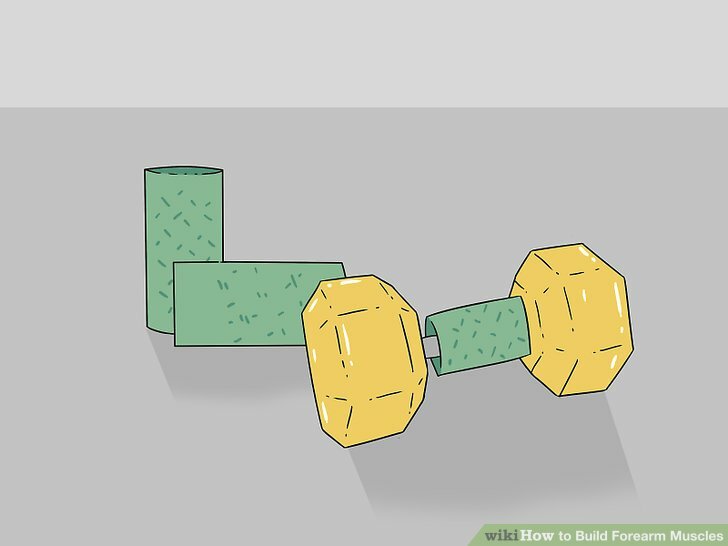 Alternatively, you can squeeze a spare tennis ball or racquetball that you have around as well. Anything dealing with isolating and working your hand grip will work your forearm muscles. Some people may prefer using their own bodyweight as the main resistance while building muscle since bodyweight workouts are easier to do at home and don’t require gym equipment. Dead hangs are simply holding onto something above you and supporting your bodyweight with your grip alone. Since the tension is on your grip, you squeeze harder the longer you hang and work forearm muscles. Do dead hangs into chin-ups. 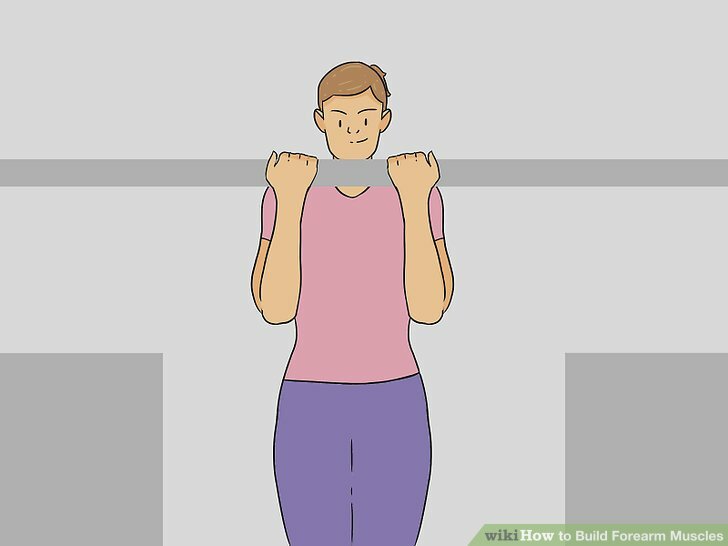 For a harder, advanced workout, you can do a dead hang of several seconds at the bottom of every chin-up. The pause will ensure that you’re not using any body swing or inertia to start the next chin-up as well. Do finger and wrist push backs. You can do this exercise either leaning against a bar or a table, or you can do it on the ground in a push-up position (which will be harder). Lean your weight against the surface, and use your wrists and fingers to push your weight back off the surface.